Army of Badassery. In a Corset. "Army of Me." New slate-colored hair by Eric Alt! 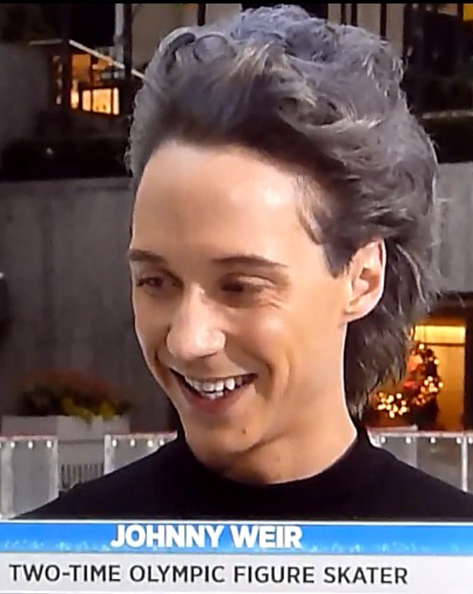 So Johnny performed on the rink at Rockefeller Center this morning for the Today Show, running on very little sleep after being awake since 1 a.m. due to the "'End of the World' rainstorm," and skating on a surface that he politely termed a "lake," with new dramatic hair by Eric Alt and clad in his gorgeous but not at all warm garter leggings by @SenaNYC, with bonus corset. 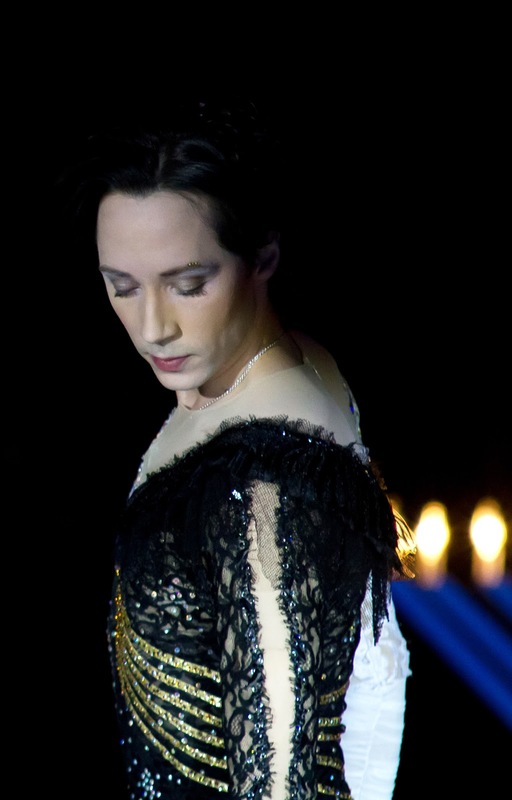 the lights of a menorah behind him. individual performance to open the show. 5th Anniversary party in Chicago. Exclusive photo © Stacy McReynolds. I had almost forgotten how luminously beautiful he is in person. It has been nearly a year since I last saw Johnny, just a week before he got married. 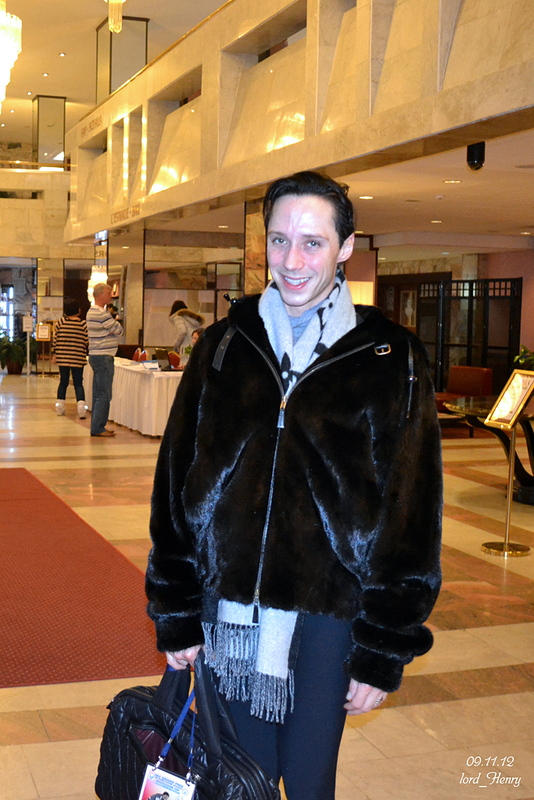 Flashback to Holiday Dreams on Ice 2011: Davey and I show up just in time to completely miss Johnny's practice, so a volunteer escorts us down a hallway at the UPenn rink to show us where to set up for the group practice coming up next, when a door to the left suddenly bursts open—and there he is! 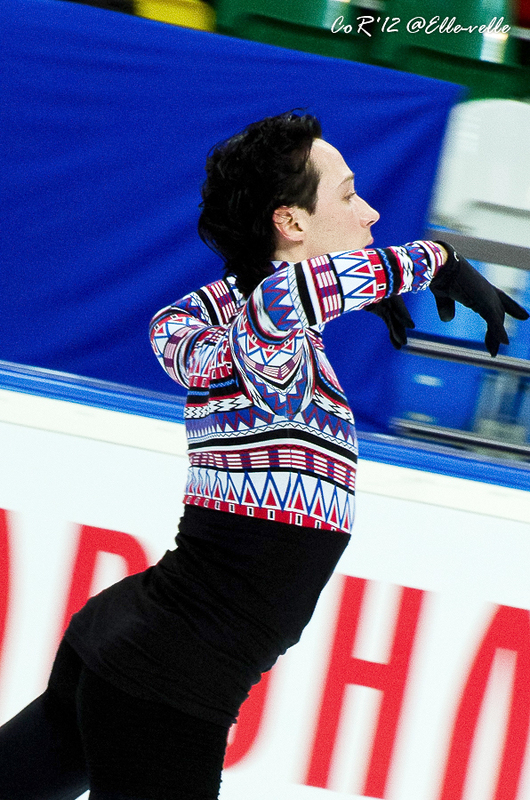 Johnny at Cup of Russia practice. of the Coolest Things Ever Dept. 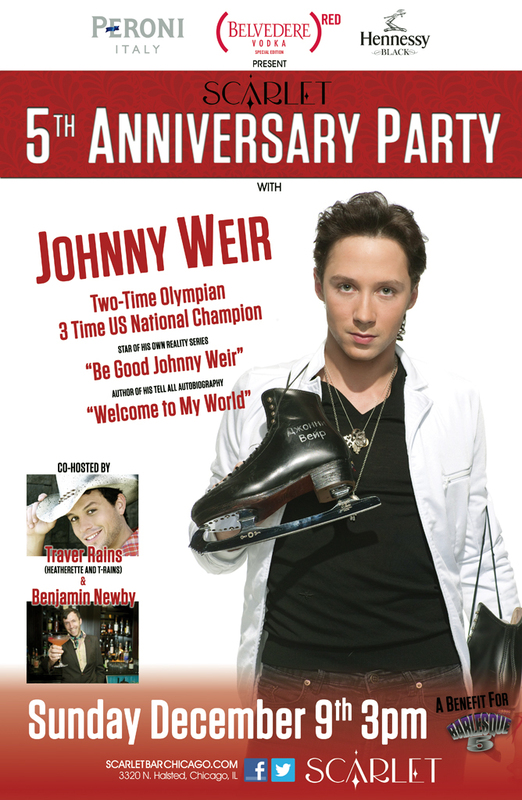 Random Tuesday Roundup, Or: OMG Johnny's Coming to Chicago! Here's the flyer!! See you there! Yep. That's me. The setup for a story in which obviously awkward hilarity ensues. See, I don't go to bars. I don't even drink. Not that I have any objection to either. It's just—my favorite people on earth, with whom I spend most of my time, are ages 14 and 19. So not a lot of drinking and bar-hopping happening here. Anyway: It has been almost a year since I last saw Johnny. So I don't care if he's leading hymns in sparkly leather priest garb at the neon-emblazoned JESUS SAVES! church down the block (which BTW would be waaaaay more of a stretch for me at this point than a gay bar). I'm there. As thrilled as ever to get to see him in person, maybe give him a hug, and perhaps—if time permits and herculean effort prevails—to actually form words, which, if I could get them right, would be: Thank you for inspiring me to take those first steps out of my comfort zone nearly three years ago, which have now led me here. To an awesome gay bar. 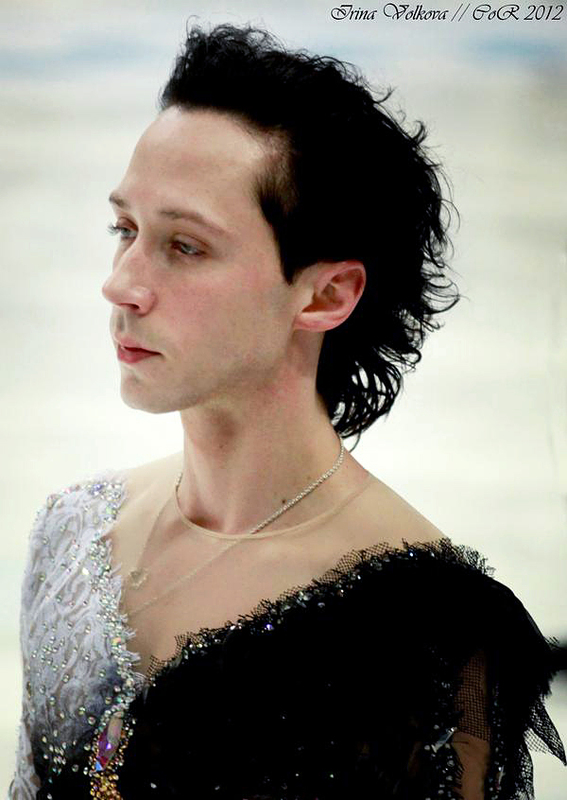 And to living out loud in an amazing and beautiful way I had never even imagined was possible until the fierce and fabulous Johnny Weir changed everything. No, not that one. 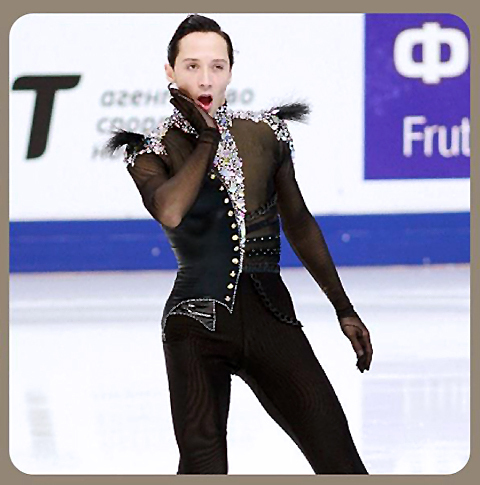 This one: The final round of voting has commenced in the ISU "Fan Favorite Costume" poll! 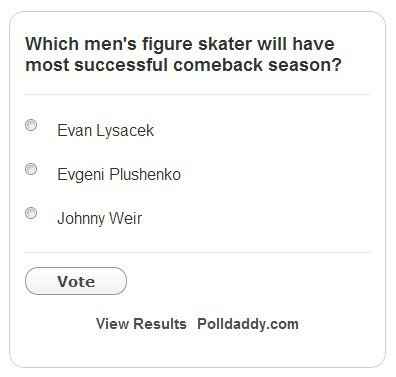 Please go here now and vote for Johnny!! Today we have a new exclusive set just for fun from the endlessly generous Nadya Vasilyeva. 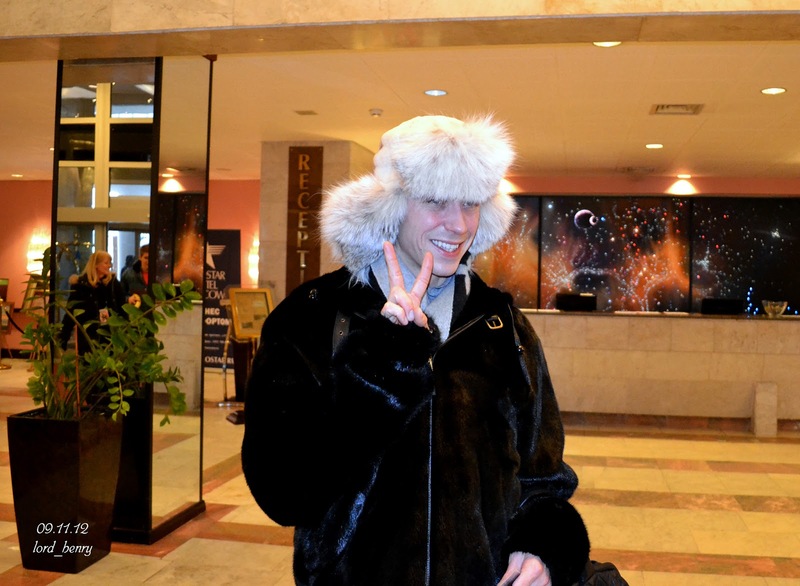 This series was taken at Johnny's hotel in Moscow on Friday, November 9, after that morning's practice. ...and off-camera, John Coughlin asks him how it went. So, Nadya explains, "Johnny decided to show him. :)"
by countless members of the Japanese fan forum. IDK what he's doing but I love the hat. And one more from Nadya. Bonus video!! Johnny Gangnam Style. the creator and my lovely friend. LOL. to your own Pinterest board! NOTE NEW DATE AND LOCATION! Yes!! More Johnny on our TVs! 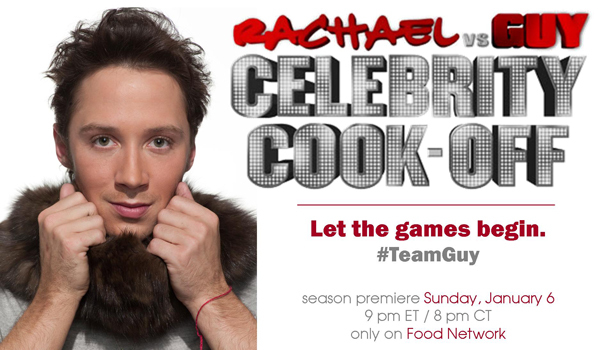 Check out the Rachael vs. Guy website for more info! 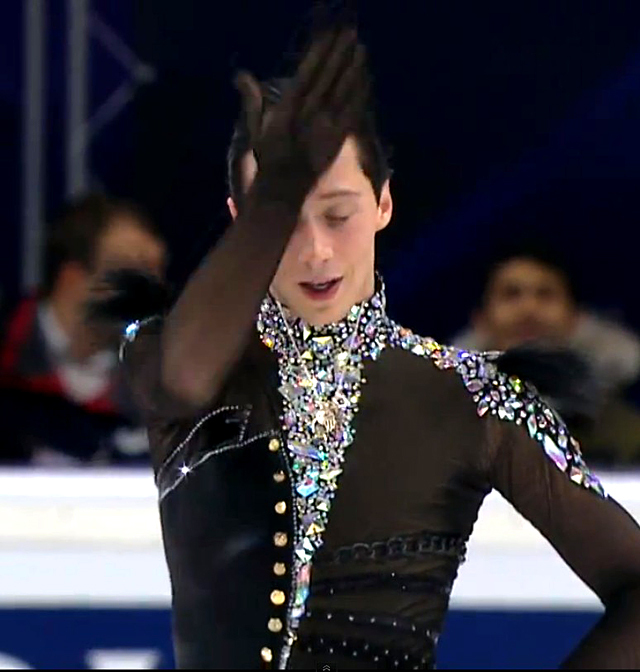 from both his Grand Prix events. new series © Elena Vasileva. To close out the week, we have the first set in a huge series of practice picspam from the lovely and generous Elena Vasileva. 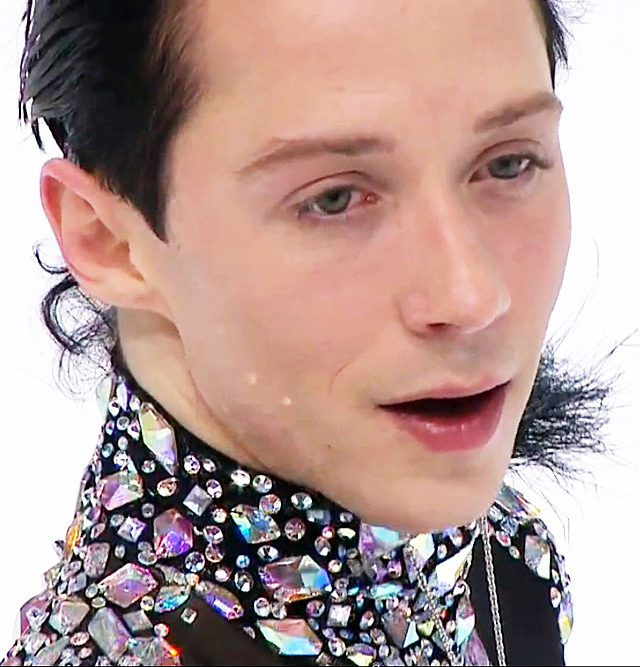 I was going to edit these down to just one set of highlights from the entire series, but as I was clicking through all 190+ shots, I was so drawn into them that it felt as though I were there, following his every movement on the ice, spellbound, as always. waiting for him in the hotel lobby. 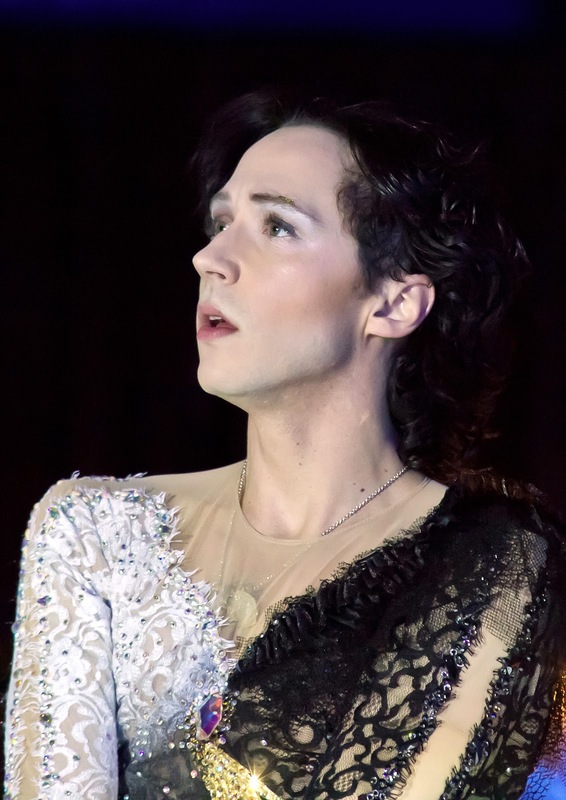 Exclusive photo © Nadya Vasilyeva. More from this series coming up! 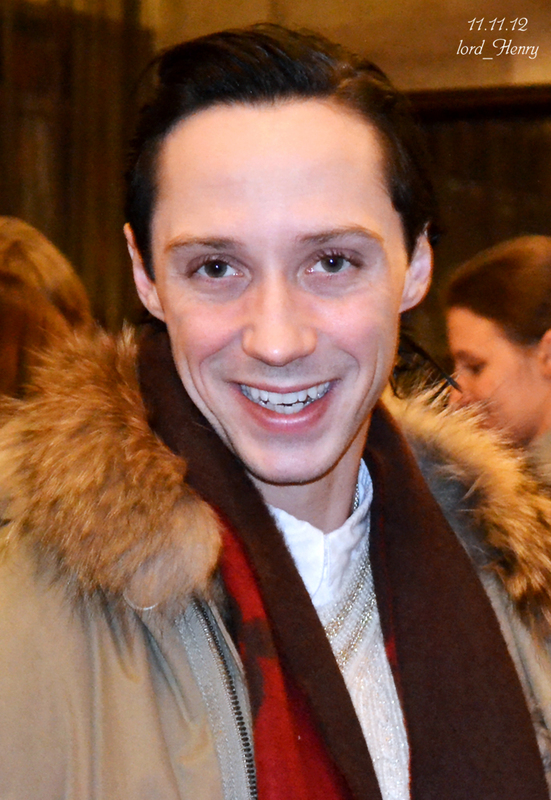 Yes, I am seriously drowning in Russian picspam. Please don't rescue me. I promise to do the same for you. Cup of Russia and at the fan meeting in Moscow. Today we present Part 2 of our Russian Lovefest, i.e. 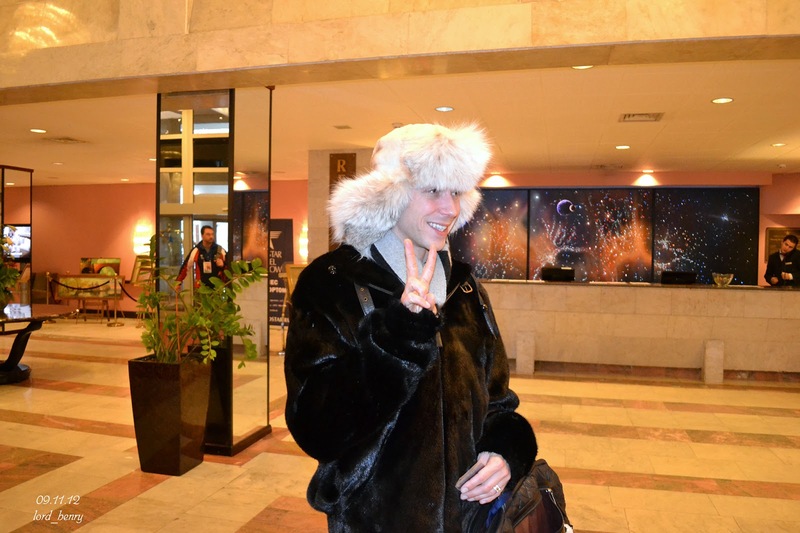 the glorious exclusive picspam we have from the Russian fan meeting that continues to make our blog overfloweth with both happy and thanksgiving. he made the decision to withdraw from the competition. 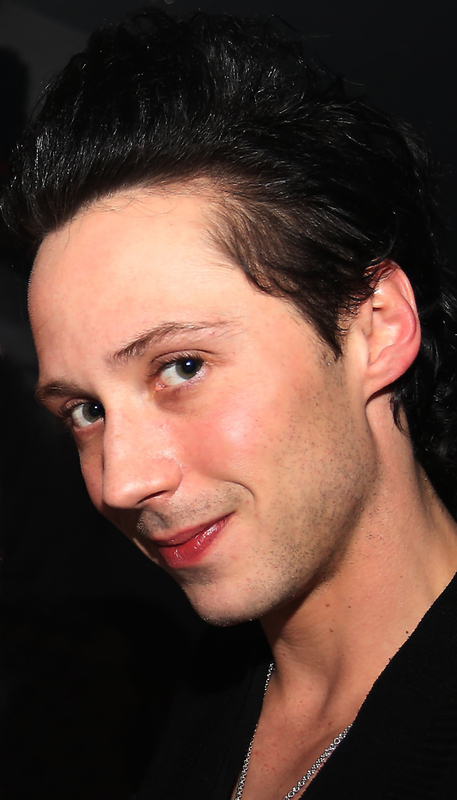 Photo tweeted by the lovely Irina Volkova. are evident on his face. 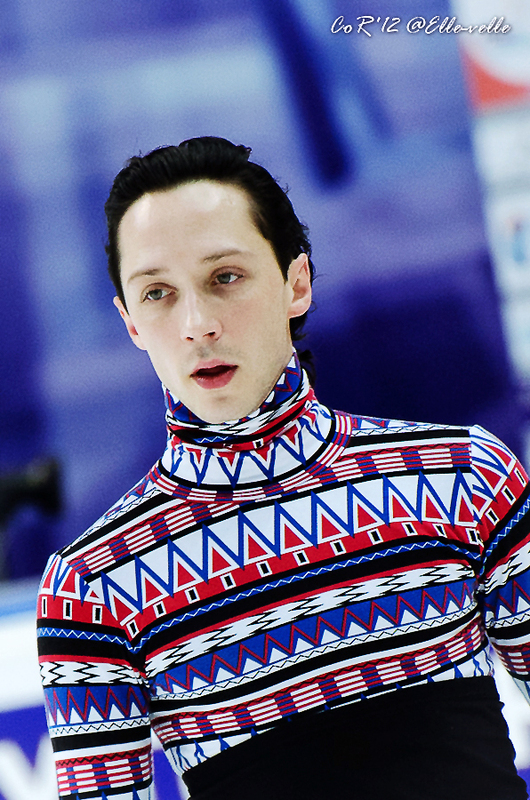 at Rostelecom Cup / Cup of Russia.  Screencap from the video of his performance. First reported by journalist Tatjana Flade via Twitter. 1 am Sunday Moscow time. Johnny, everything said below remains unchanged, though perhaps more heartfelt than ever. 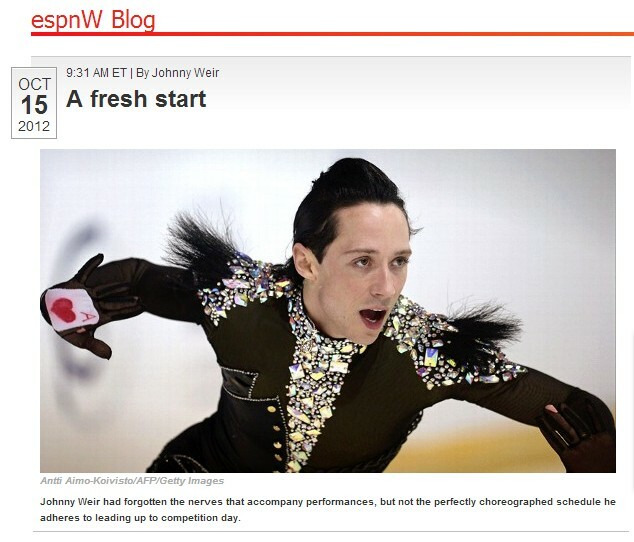 I know that wasn't the short program performance you had hoped to give. I know he will do the best he can at that moment. That is what skating is: doing what you can at that moment. 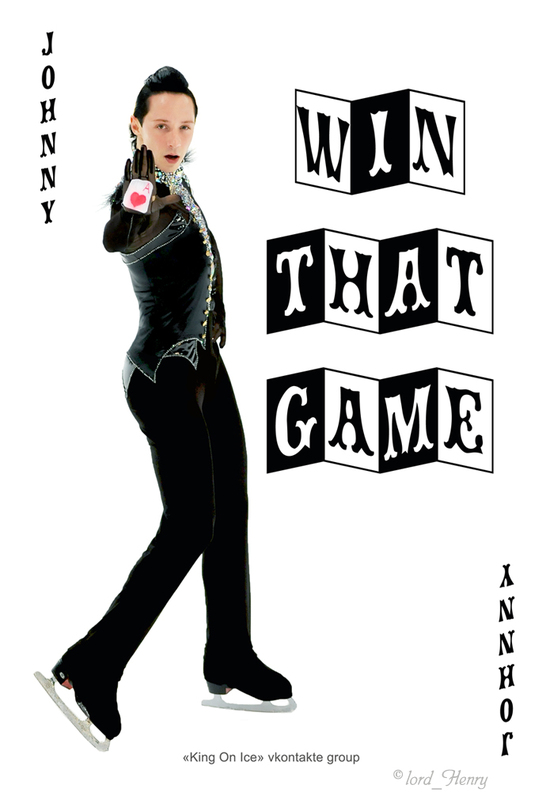 You can be trained, prepared, have beautiful costumes, have beautiful programs — and not have a good skate. It is just the way it is. Yep. And as bad as I felt for you in that moment, I had to smile at your facepalm at the end of the program. You're always you, and we love you for it. And my heart broke for you. Please know that you have nothing to apologize for. You are a warrior and an inspiration to all, on and off the ice. You change people's lives. And you are never better than when you have to fight your way back. And you kept your promise to us. We are always so proud of you, and so proud to be your fans. Which was evident in the immediate outpouring of love and support for you in response to your tweet. Your Twitter timeline was filled with literally hundreds of messages within minutes, and they were still pouring in hours later. I screencapped as many as I could, although I know you're Twitter-savvy these days and you know how to look for people's replies to you. But your timeline moves swiftly, so I preserved as much as possible with the thought of posting them here in case you ever need to be reminded of how much support you have. I ended up with 35 pages. 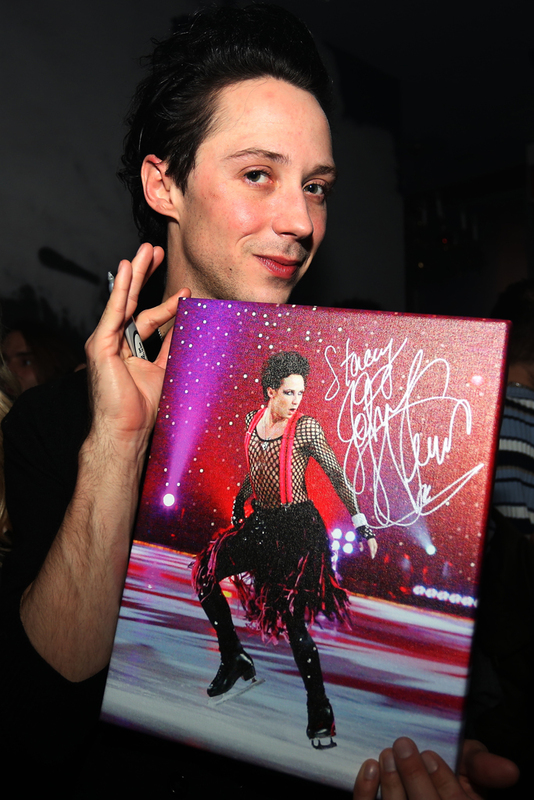 You truly are the most beloved skater in the world. 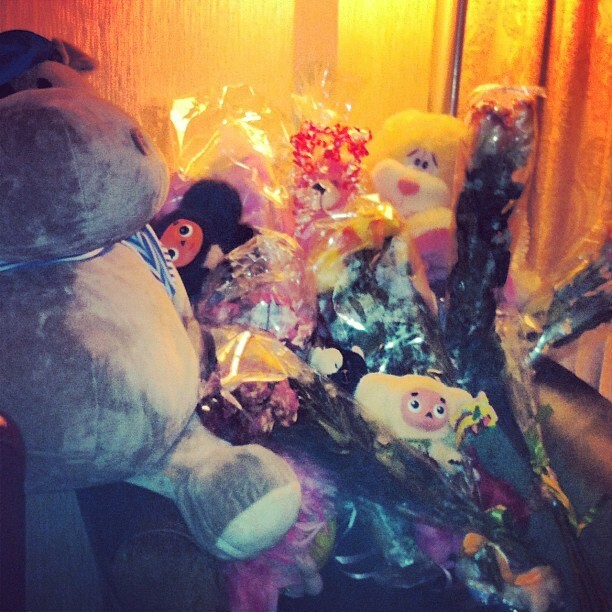 ("Thank you all for everything! The blog has a Facebook page! through the posts and photos!